Lots of you have sent us nice drawings, pictures and photos, so we’d thought we’d put the best ones on display! Look below and see if you can find your picture. If you haven’t sent us a picture but you would like to, please email info@hagstromsaab.co.uk - don’t forget to tell us your name and age and we need your parents' permission if you're in the photo!! Hi my name is Freyja. I'm a friend of Emma and Ashley. My dad really loves Saabs and that is why we have a garden full of them. He can't stop buying them - I think he is addicted to Saabs. I like some Saabs such as convertibles, limousines and all turbos. 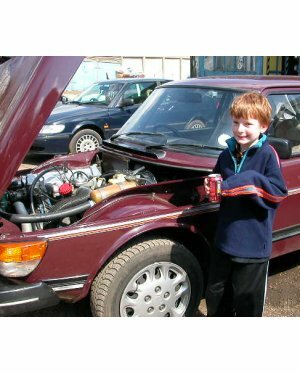 We have a 99 Turbo that is now for sale, a silver 900 Turbo and a white 900 Turbo, a blue 900SE and a Kermit green 96. We have also got lots of other Saabs in the garden. Back to Hello everybody! | Ashley’s project | Emma’s report | Paint your own Saab!